Ronald Stevenson (born 1928) has been one of the foremost exponents of the art of transcription in the British Isles for over fifty years. 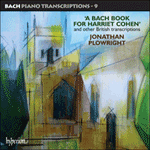 In addition to his original compositions (which include the huge eighty-minute Passacaglia on DSCH and the choral symphony Ben Dorain) he has made piano versions of works by a huge range of composers from John Bull to Alban Berg. His version of Komm, süsser Tod BWV478 (the same chorale as set by Frank Bridge for Harriet Cohen’s Bach Book), dates from April 1991. It is, however, a transcription at one remove: for Stevenson has here made a solo piano version not from Bach’s original but of the orchestral arrangement by Leopold Stokowski. Stokowski himself said of his version that he had ‘tried to imagine what Bach would do had he had the rich resources of the orchestra of today at his disposal’. In re-imagining Stokowski’s orchestral textures for the keyboard Stevenson makes use of a rich palette of piano colour, especially in the middle and bass registers, and a subtle use of pedalling. He also had in mind Stokowski’s performance of the piece. The basic tempo is immensely slow, much slower than in the Frank Bridge version (a comparison of the two settings is fascinating). The surging, authoritative arpeggio writing at the climax makes clear that this is, above all, piano music. The final, heavenward-ascending gesture is Stokowski’s addition to Bach, newly given pianistic form by Stevenson. Ronald Stevenson (né en 1928) a été parmi les principaux transcripteurs des îles britanniques durant plus de cinquante ans. On lui doit, outre des compositions originales (dont l’énorme Passacaglia on DSCH de quatre-vingts minutes et la symphonie chorale Ben Dorain), des arrangements pianistiques d’œuvres d’un très large éventail de compositeurs, de John Bull à Alban Berg. Sa version pour piano solo du choral Komm, süsser Tod BWV478 (celui-là même choisi par Frank Bridge pour le Bach Book) date d’avril 1991. C’est une transcription à un détail près: elle se fonde non pas sur l’original bachien mais sur l’arrangement orchestral de Leopold Stokowski, lequel estimait avoir «essayé d’imaginer ce que Bach aurait vraiment fait s’il avait eu à sa disposition les riches ressources de l’orchestre actuel». En repensant pour le clavier les textures orchestrales de Stokowski, Stevenson déploie une riche palette de couleurs pianistiques, surtout dans les registres médian et grave, et use subtilement des pédales. Il avait aussi en tête l’interprétation stokowskienne de cette œuvre. Le tempo de base est immensément lent, bien plus que dans la version de Frank Bridge (comparer les deux moutures est fascinant). L’écriture arpégée du climax, autoritaire et déferlante, dit sans ambages que c’est, avant tout, de la musique pour piano. Le geste final, qui grimpe vers les cieux, est l’apport stokowskien à la nouvelle forme pianistique de Bach imaginée par Stevenson. Ronald Stevenson (*1928) ist, wie bereits erwähnt, seit über fünfzig Jahren einer der bedeutendsten britischen Vertreter der Transkriptionskunst und hat neben seinen Originalkompositionen, darunter auch die gewaltige, achtzig Minuten dauernde Passacaglia on DSCH und eine Choralsinfonie Ben Dorain, Klavierfassungen von Werken zahlreicher Komponisten von John Bull bis Alban Berg geschrieben. Seine Version des Chorals Komm, süsser Tod BWV478 (der auch von Frank Bridge für Harriet Cohens Bach Book transkribiert wurde) entstand im April 1991, doch handelt es sich um eine Transkription aus zweiter Hand, denn Stevenson basiert seine Transkription für Soloklavier nicht auf Bachs Original, sondern auf der Orchesterfassung von Leopold Stokowski, der darüber sagte, er habe „sich vorzustellen versucht, was Bach getan hätte, wenn ihm die reichen Ressourcen eines modernen Orchesters zur Verfügung gestanden hätten“. Zur Umformung von Stokowskis Orchesterstrukturen für die Tastatur nutzt Stevenson eine reichhaltige Palette von Klavierfarben vor allem im mittleren und tiefen Register und subtilen Pedaleinsatz. Außerdem dachte er an Stokowskis Aufführungspraxis mit ungemein langsamem Tempo, das noch langsamer als bei Frank Bridge ist (ein Vergleich der beiden Versionen ist faszinierend). Das sich aufschwingende, selbstbewusste Arpeggio am Schluss macht deutlich, dass es sich in erster Linie um Klaviermusik handelt. Die abschließende himmelwärts steigende Geste ist Stokowskis Ergänzung von Bach in neuer pianistischer Ausformung durch Stevenson.